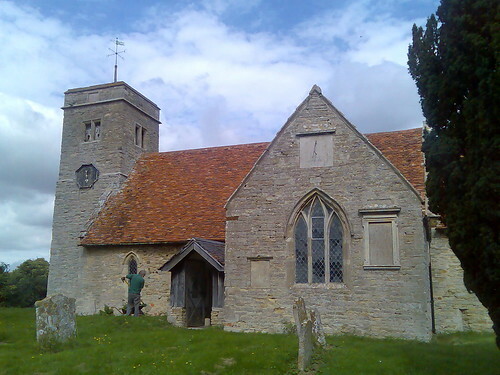 Continuing the Surname Saturday genealogy blogging meme by looking at the HALE family of Knotting and Potton, Bedfordshire. For this Surname Saturday entry, I’m going right back to the late 17th century to tell you about the Hale family from a small village on the Bedfordshire/Northamptonshire border. In 1660, with the death of Oliver Cromwell and the restoration of Charles II still fresh in people’s minds, a William Hale (b.c. 1621) and his wife Elizabeth from the tiny village of Knotting had welcomed their son Thomas into the world. By 12th August of that year he had been christened in the parish church. It’s not known yet whether Thomas had any siblings but I suspect that he probably did as there are some other Hales in the same village at the same time (a William and Eleanor Hale are having children in the same parish during the same period). On 14th September 1686, when Thomas Hale was about 26yrs old, he married Bathsheba Jennell at Knotting parish church. Sadly, within 10 months he became a widower with Bathsheba being buried at Knotting on 21st August 1687. Research notes at FamilySearch.org show the birth of a daughter, Elizabeth in 1687, whom I’m assuming was the daughter of Bathsheba. Perhaps she died during or as a consequence of Elizabeth’s birth? By 1689, Thomas had remarried to a woman known only (so far) as Elizabeth (possibly Elizabeth Fairy or Elizabeth Westcot – the Knotting parish registers will hopefully reveal this), and on 4th July the family returned to the Knotting parish church to christen their new son William Hale. William appears to have been the first of at least 10 children for this new family, with Giles Hale being the youngest born in 1703. William worked as a tailor. By 1706, he had met and married Elizabeth Truelove in Potton. It was here that the couple made their home, bearing 11 children, starting with Elizabeth Hale in 1707 and ending with John Hale in 1725. It appears that William died in 1730, with his wife following him to the grave in 1735. The 1911 census for Knotting included a Mr Hale. Now there are some seriously odd names around aren’t there? Peaches Geldof, Apple Martin, Princess Tiaamii Andre, Blanket Jackson and Moon Unit. These are all names of celebrity offspring but it’s not just modern-day children who have fallen foul of odd sounding names. I know that you can probably do better, so leave your REAL ancestor names (with links?) in the comments section.